Cat dental disease is a common issue. But some of the symptoms that your cat has a dental disease can be hard to decipher. Let’s look at some right here! According to the American Veterinary Dental Society, almost 70 percent of cats start showing signs of oral disease by their third birthday. If your cat’s teeth are in bad shape, that can contribute to health problems including heart and kidney disease, and decrease your cat’s quality of life. Because cats hide their pain, you probably won’t know your cat’s mouth is hurting until her oral disease is very severe. Although your cat can’t tell you if she has a toothache, there are five signs that can clue you in to the fact that her mouth may be bothering her. Bad cat breath isn’t normal — if your cat has bad breath, it may be a sign of cat dental disease. Photography ©NiseriN | iStock / Getty Images Plus. It’s not normal for a cat’s breath to smell fishy or rotten. If you need to turn your head away when your cat breathes on you, or if your skin stinks after she licks you, that’s a good sign that your cat is having dental troubles. If your cat seems to chew with only one side of her mouth, or if she’s dropping her food when she eats, that may mean that she’s having oral pain. If your cat approaches the food bowl and acts like she’s hungry, but then seems reluctant to eat, her mouth is probably bothering her. If your cat used to enjoy having the sides of her face petted and no longer does, it may be because her mouth hurts. If your cat is salivating more than usual — especially if the saliva contains blood— that’s a sign of dental disease. Cats may also paw at their mouths or shake their heads because of the pain. If your cat is experiencing any of these symptoms, lift her lip by her molars, if she’ll let you. If you see yellow-brown gunk on her teeth, that’s tartar buildup. If your cat’s gums are red, that’s gingivitis, or inflammation of the gum tissue. Severe oral disease can result in bleeding gums, broken teeth, and a host of other painful problems. 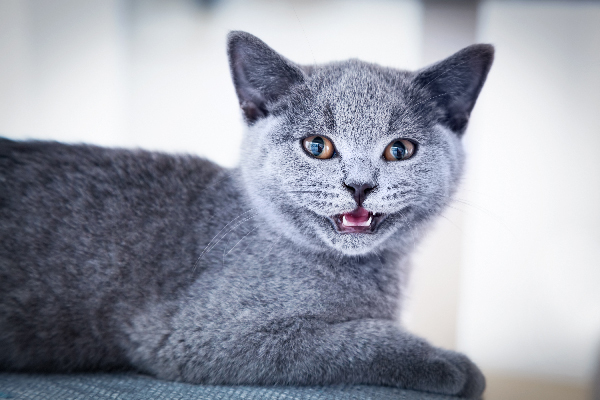 If you see gingivitis or tartar buildup, or if your cat is showing the signs above but won’t let you touch her mouth, call your vet and schedule an appointment. The first step in treating cat dental disease is a cleaning and scaling. In this procedure, which is done under general anesthesia, the veterinarian uses instruments to remove tartar from your cat’s teeth and below her gums. After the tartar has been removed, the vet may discover that some teeth need to be removed because of resorptive lesions (cavities) or weakening of the bone structure holding the tooth in its socket. Once the tartar is removed, the vet will polish your cat’s teeth to remove any microscopic scratches that could lead to decay. In order to keep your cat’s teeth healthy and shiny, start a preventive care program consisting of brushing your cat’s teeth with toothpaste made just for cats. A web search will yield a lot of information on how to clean your cat’s teeth at home. Products such as dental chews or drinking water additives can also reduce tartar buildup. Keeping your cat’s mouth healthy will keep your cat healthy and allow you to enjoy many happy years together. 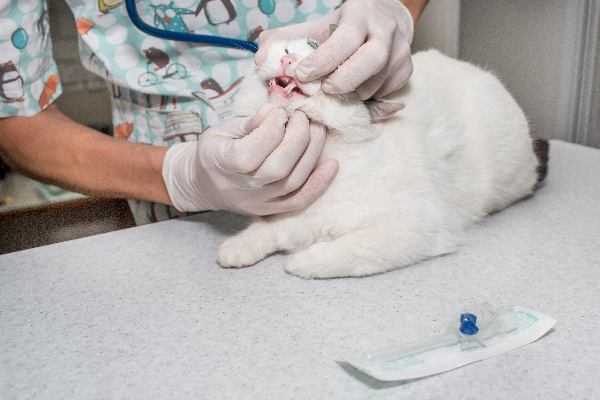 Tell us: Has your cat ever suffered from a dental disease? What were the signs? Thumbnail: Photography ©Darunechka | iStock / Getty Images Plus. My 9 year old Bombay had periodontal disease so we had 4 teeth pulled. Now he’s not constipated all the time like he’s been for so long and nobody knew what the cause or what to do. It turned his life around as he’s such a happy cat now. His teeth were putting poisons into his system & probably would have killed him. So glad we had his teeth fixed. I recently adopted a feral kitten. He’s warmed up to us and forgot he was feral. I took him to the vet, he got his shots and everything but he has bad breath. I told the veterinarian that when he eats pellet, half falls out of its mouth. Thing is, he shows no signs of pain when you touch his mouth and his gums seem normal, no teeth rotten nor signs of tartar. He’s 3months old, what can I do? It seems odd that a kitten would have dental disease?? Did your vet tell you that your kitten needed to have his teeth cleaned?